I ended up going downtown to find them. It wasn't as bad as I thought it would be, although that doesn't say much. I was looking forward to going downtown with slightly less trepidation than a trip to the dentist. I don't like city centres. There's cars and people and tall buildings and people and signs and people. I don't like people. It wasn't too bad, though. The trip -- at least to the parts of downtown that I walked through -- ended up being uncomfortable, but not to the level of anxiety. I wouldn't have wanted to do it at night, though. I had to walk for quite a bit. I left university and headed downtown, but after a few blocks I realized that I only had ten pounds on me. Not having any kind of reference for how much footwear cost here (other than Clarke's, which has designer men's slippers for 20 pounds or more! ), I headed back home to pick up more money before going downtown. That added about 40 minutes to the trip. I brought £500 with me, but I only put £100 in my wallet at once. I'd just finished one set of 100, and thus had to pick up another 100. 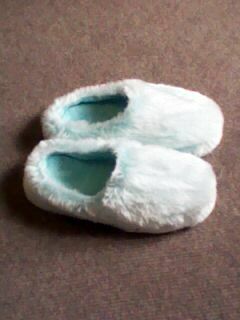 Anyway, I'm quite happy with these slippers. The outside of them is even softer than it looks... I spent a few minutes with my feet on the top of the slippers. Yes, I know that's not how you're supposed to wear them. But they were so soft! They remind me of my mother's fake rabbit-fur coat that she used to wear when I was a child. And they were only £2.96! I'm now officially a student. Postgraduate research students (i.e. PhDs) registered / matriculated at the very end of the registration period. In addition to having a student card, this marks the first time I went to the main university building. The EE&E building (ok, the civil engineers share it too) was built in the 1960s. It actually reminds me more of the Chemistry department at SFU than anything else... the building has a wonderful grey concrete exterior (I honestly like the SFU architecture! ), and the inside has a certain smell that you only get from various gasses leaking out of experiments. Ok, the smell is actually probably just from the type of floor wax they use, or the particular brand of rubber grips on the stairs, or whatever. But I'm going to ignore that. In my mind, the smell comes from Real Experiments happening. I think the terawatt laser is in the other engineering building, but there's still plenty of Real Science (albeit applied science) happening here. They're also serious about restricting out-of-hours access. You need a keycard, need to sign in, etc. Yesterday, I left my desk at about 5:25, and the front door was locked by the time I got there. I had to exit through the side "out of hours" (also "smoking area") door. In other news, I finally managed to build and upload lilypond 2.13.4. I've officially been the release manager for months, but the build process was a bit out of date, and requires a lot of CPU time to compile. It took me a week and a half, but I (and Jan, one of the core developers... actually, it was mostly Jan; I just send him error messages) finally managed to cross-compile the lilypond binaries for all 8 platforms. As fate would have it, we finished this task about half an hour before my registration time, so it really did fit neatly into a "in Glasgow but not a student" task. In mundane matters, I have my bank account, and the bank card, pin, and online banking registration stuff have arrived. My Sainsbury's club card (it's called net-something, but I can't remember what it is) has arrived. The Tesco card hasn't arrived yet, which is weird since I signed up for that before the Sainsbury's card, but I have a paper "temporary" card, so it doesn't matter if the long-term plastic one hasn't arrived yet. The only major remaining (necessary) task is to get a cell phone, which I'm still putting off. I have no excuse, though, so on Saturday I'll get it done. I should probably also try riding the subway (it's above-ground for some of the way, so it might be a nice sight-seeing thing), looking at downtown, looking at the Glasgow equivalent of the Sydney opera house (I can't remember what they do there), etc. I'm also thinking about buying a bike. I can't claim that I need one; the 15-minute walk isn't all that long. (in fact, it's 15 minutes long!) But it would be even nicer if it were a 5-minute bike instead. Besides, I miss being a biker. However, the prices are insane! Maybe I'm just looking in all the wrong places (google search "uk bike store"), but the lowest prices I'm seeing is £200. I can get a new bike in Canada for $100 -- one quarter of that price! Granted, it doesn't help that I don't know what type of bike I want... mountain, hybrid, hardtail, bmw, road, triathlon, cross-country, folding, tandem, trailer... ok, some of those are easy to eliminate (such as triathlon). But fundamentally, I just want something that moves forward when I push down on the pedal. I don't care if it's mountain, hybrid, road, cross-country, or hardtail. I guess I need to *shudder* talk to a salesperson. I feel a bit cheap -- no pun intended -- marching in and saying "I'd like the least expensive bicycle you have, because I'm going to ride it for 15 minutes a day along almost-completely flat roads". But hey, that's what I do want, and I'm not going to buy anything else. On the home front, I'm getting my just desserts. A few days ago, I was quite smug about having (almost) everything set up, having my sleep schedule finally adjusted, etc. So two day ago, the hot water broke. As a related investigation, one flatmate and I have determined that either the central heater is broken, or it requires some special trick to enable. We'll check with our other flatmates later. And finally, last night I had a normal insomnia night, taking over an hour to fall asleep, and then waking up 3 hours later and taking another hour to return to sleep. Still, I remain in good cheer. The water is kind-of like camping. Besides, I'm a Canadian. I just think of the times that my igloo collapsed because I didn't shape the ice chunks at the right angle, or that time I dropped my seal-hunting spear into the water and dove into the icy ocean to retrieve it. And about my wilderness ranger training, where they deliberately give you hypothermia, so you'll recognize the symptoms if you get them later. ... ok, none of those actually happened. But I'm sure they have happened. To some Canadians. So I channel those imaginary Canadians and embrace the cold water. Besides, after the first 2 or 3 minutes (during which I tend to jump up and down... hey, it helps, if only psychologically!) the water doesn't seem so bad. The cold room isn't anything new; I'm used to my basement room being 15 degrees. My brother blasts a heater, but I just pile on more clothes and/or snuggle in bed. Admittedly, the quilt in the resident isn't very good, but I bought an extra blanket / "luxury throw" (for £3 -- it can't be all that luxurious! ), so I'll double-blanket the bed. Finally, I'm vaguely regretting buying a new netbook in August. Don't get me wrong; I love this machine. But switching keyboard layouts between US and UK is slightly inconvenient. I mean, the @ and " keys are swapped, for no apparent reason. If I'd waited and bought a netbook in the UK, then I could have gotten adjusted once, rather than continually switching between the two layouts. Oh well. I'll probably buy an ARM netbook next spring, and reserve this machine for my "powerful laptop". I mean, given the price of netbooks now, and the amount of time I spend on them, buying one each year isn't a bad bargain.